Eureka is a project by Hamburg based Frank Bossert, who more or less is in charge of all the instruments, with support on vocals by Billy Sherwood (Yes) and Kalema as well as three more musicians on synthesizers, horn section and narration. 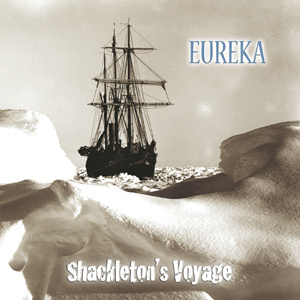 Shackleton’s Voyage, his already fourth release, is a concept album about Antarctic explorer Sir Ernest Shackleton’s first of twenty-two expeditions which was harshly ended by an iceberg. This musical journey combines elements of prog rock, symphonic rock and Celtic music. Despite occasion guest vocalists, Shackleton’s Voyage is mainly an instrumental effort with a penchant for quieter sounds. First highlight is Heading South, where a great sounding Moog synthesizer creates an incredible atmosphere. The remaining tracks are also quite wonderful and perfect ear fodder for fans of Vangelis, Marillion and Mike Oldfield. Mr Bossert claims Rush and Yes to be his main influences, although I wouldn’t have really recognised these parallels. Anyway Shackleton’s Voyage should be listened to in one take, as the tracks by themselves seem a little unspectacular and commercially unmarketable. As a whole, the album leaves a partly melancholic, partly dreamy mood that can really strike your heart if you’re in the right state of mind. Some may think of Shackleton’s Voyage as too tame and even boring, others will be certainly drawn into the spell of the album’s strong sounds that could work as well as a movie soundtrack. This is definitely not a common progressive rock album and cannot easily be compared to other genre bands.